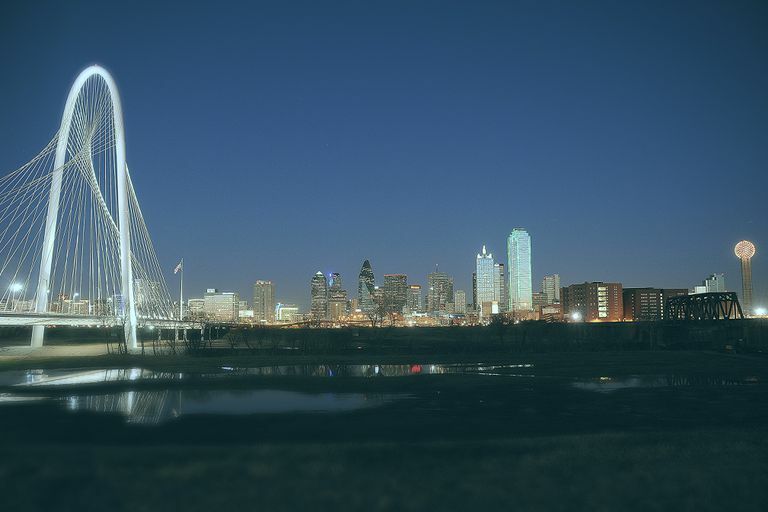 The city of Dallas, Texas has architecture to fit everyone's tastes and needs. From the swirling white Margaret Hunt Hill Bridge designed by the Spanish architect Santiago Calatrava to skyscrapers by American Pritzker winners Philip Johnson and I.M.Pei, to a hemicycle theater by Frank Lloyd Wright and a 1970s-era observation tower named Reunion, Dallas architecture says it all. A tour of the city is a fun-filled crash course of designs by world-class architects. Here's a brief overview of what to expect when you visit this city in the Lone Star State. Today, many Americans of a certain age associate Dallas with the assassination of President John F. Kennedy. Lee Harvey Oswald fired his gun from the sixth floor of the Texas School Book Depository Building, killing an American president who was riding in an open car on November 22, 1963. Architect Witold Rybczynski has called the building "a surprisingly handsome structure in a simplified Romanesque style, with giant pilasters and heavy brick arches." The 100 foot square building rises seven floors in a style common to that time period, Romanesque Revival. Located at 411 Elm Street near Dealey Plaza, the Texas School Book Depository was built between 1901 and 1903 — about 60 years after Texas joined the union. Dealey Plaza is the 19th century birthplace of Dallas, Texas. Tragically, the area has become famous for the 20th century killing of an American president. The sixth floor now serves as a museum dedicated to the history of President Kennedy's assassination. Years before Pritzker Laureate Philip Johnson helped design Thanks-Giving Square in Dallas, the American architect tackled this presidential memorial, still an object of controversy. Located one block from Dealey Plaza, behind the Old Red Courthouse and near the Texas School Book Depository, Johnson's JFK Memorial is designed as a modern tomb. Inside the structure is a low, granite rectangle. Carved into the side of the grave-like stone is the name John Fitzgerald Kennedy in gold. The entire monument is a hollow cube 50 foot square, roofless, and 30 feet high. It was constructed with 72 white, precast concrete columns 29 inches above ground and 8 column "legs." "It is all, sad to say, poorly done," architect Witold Rybczynski wrote on Slate.com. "Painted precast concrete is hardly a noble material, and the blank surfaces are relieved by rows of roundels that make the walls look like mammoth Lego blocks." The memorial was dedicated June 24, 1970. Architecture critics have never warmed up to its design. Christopher Hawthorne in the Los Angeles Times wrote that Johnson's design "also symbolizes the city's deep ambivalence about commemorating the assassination. A spare cenotaph, or open tomb, designed to be built in marble, it was instead cast in cheaper concrete. And its location east of the assassination site suggested an effort to tuck the history of that day away." Critics aside, the JFK Memorial by Philip Johnson is a popular spot to reflect on that day and the too often fragility of life. "Kennedy was not a notable patron of architecture, but he deserved better than this," wrote Rybczynski. I. M. Pei and Theodore J. Musho designed the concrete City Hall for Dallas in the 1970s when the brutalist style of modernity was common for public architecture. Described by the architect as "boldly horizontal," the city's center for government becomes a "balanced dialogue with Dallas's skyscrapers." Sloping at a 34 degree angle, each floor of the 560-foot long building is about 9.5 feet wider than the one below it. At 113 feet high, with a top width of 192 feet, the design could be considered a brutalist "ship of state." It has been functioning in the Texas seas since 1977. The annual Texas State Fair, which claims to have the largest ferris wheel in the Western hemisphere, takes place in a land of art deco — Fair Park in Dallas, site of the 1936 Texas Centennial Exposition. When Texas commemorated 100 years of independence from Mexico, they celebrated in a big way by putting on a world's fair — during America's Great Depression. The Exposition's architect, George Dahl, built upon the ideas of the City Beautiful movement and previous world fairs in Philadelphia (1876) and Chicago (1893). The 277-acre Dallas exhibition area centered around the 1930 Cotton Bowl football stadium on the outskirts of town. Art deco design and concrete block building materials were the tools of the time. Dahl's Esplanade became the site's "architectural focal point." Dahl commissioned a young sculptor, Lawrence Tenney Stevens (1896-1972), to create the statuary for the Esplanade. The statue shown here, Contralto, is a David Newton reproduction of the original 1936 art deco piece. Many of the original art deco buildings are still standing and being used every year at the Texas State Fair. Today, Fair Park claims to be "the only intact and unaltered pre-1950s world fair site remaining in the United States – with an extraordinary collection of 1930s art and architecture." Near the 1970s-era Reunion Tower sits another Dallas landmark — the 1892 Dallas County Courthouse. Built of rusticated red sandstone with marble accents, it was designed in the Richardsonian Romanesque style by architect Max A. Orlopp, Jr. of the Little Rock, Arkansas-based firm Orlopp & Kusener. Now the Old Red Museum, the Old Red Courthouse is an historic example of the Romanesque Revival style made popular after Boston's 1877 Trinity Church designed by American architect Henry Hobson Richardson. In contrast with the 19th century Old Red is Fountain Place, to the right in this photograph. The architects at Pei Cobb Freed & Partners designed a unique skyscraper to live within the surrounding plaza. Like a crystal growing from the surrounding landscape, the design expands upon the urban ideas of Mies van der Rohe's Seagram Building in New York City, built three decades earlier. Built in 1986, the architectural style is in sharp contrast not only with the Old Red Museum Courthouse, but also with Pei's earlier work at the Dallas City Hall. "The overall building mass is conceived as a large cube floating over the site's landscaped plinth. An acre of undulating roofscape comprised of rock and native drought-resistant grasses reflects Dallas's indigenous geology and demonstrates a living system that will evolve naturally over time." The Perot Museum of Nature and Science opened in 2012. It is located in the planned community of Victory Park, a brownfield reclamation project of developer Ross Perot, Jr., son of Texas billionaire Ross Perot. Located at 2201 North Field Street, the Perot Museum strives to be a learning place for all ages, a place to stimulate creativity, curiousity, and concrete solutions to today's problems. Its mission is "To inspire minds through nature and science." The collection is a consolidation of three separate Dallas museums now under one roof at the edge of the city. At night, the building appears to float, as lights shine out from beneath the concrete cube. Tensioned cables support a ground floor of structural glass in the lobby areas. The science behind the architecture complements the collection inside. "By integrating architecture, nature, and technology," writes the architect, "the building demonstrates scientific principles and stimulates curiosity in our natural surroundings." President George W. Bush ("Bush 43") is the son of fellow Texan and fellow POTUS George Herbert Walker Bush ("Bush 41"). Both presidents have libraries in Texas. The Bush presidency after the terrorist attacks of September 11, 2001 is a major part of the exhibitions at the Bush 43 center in Dallas. Bush chose New York architect Robert A. M. Stern and his firm RAMSA to design the Bush center on the campus of Southern Methodist University. Unlike Thom Mayne, Stern, another world-class architect, designs in a more modern traditional manner. Compared with Mayne's Perot Museum, which was completed at roughly the same time, the George W. Bush Library Presidential Library and Museum looks classical and staid. 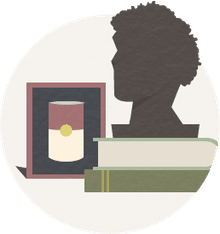 Presidential libraries are places of history, research, and partisanship — rarely are all sides of presidential problems examined fully. Presidential libraries archive the documents from only one president with one point-of-view. Researchers examine information from many sources to present balanced opinions. Home of the Dallas Symphony Orchestra, the Morton H. Meyerson Center opened in 1989 as a Dallas owned and operated entity. It was one of the first venues built within the designated Dallas Arts District. Meyerson chaired the building committee and ensured the quality of the endeavor for its major donor, Ross Perot. The performance hall, the Eugene McDermott Concert Hall, is named after another donor, the founder of Texas Instruments. The architect, I.M.Pei, was at the height of his career when chosen as the design architect, even winning the 1983 Pritzker Architecture Prize while in the midst of this commission. McDermott Hall is a rectangular shoebox performance area, but it is surrounded by circular and pyramidal public areas of marble and glass. The architect combined the private and public nature of the venue within the design itself. A sun canopy that surrounds the Winspear Opera House extends the building's footprint into Sammons Park, designed by landscape architect Michel Desvigne. Winspear's shading grid of metal louvers also gives linear geometric form to the off-center, elliptical auditorium area within the irregular hexagon structure — very high-tech modernism. Winspear Opera and the nearby Wyly Theater are the major venues of the AT&T Performing Arts Center that opened in 2009. Architecture critic Nicolai Ouroussoff thought that the Winspear design didn't "match the innovation of the Wyly," but he appreciated the thoughtful design. "Conceived as a classic horseshoe design packed inside a faceted glass case, it is an old-fashioned statement about architecture as public art, in the spirit of 19th-century Paris." Margot and Bill Winspear donated $42 million for the City of Dallas to hire Sir Norman Foster and Spencer de Grey to design the venue. The Margaret McDermott Performance Hall and the much smaller Nancy B. Hamon Recital Hall come off the C. Vincent Prothro Lobby, showing that it takes a village of donors to make art and architecture in Dallas. The Dallas Arts District calls this design for the Dallas Theater Center the "world's only vertical theatre." The lobby is underground, the stage area is at street-level surrounded by glass, and the production development areas are on the upper floors. The performance stage is the focal point of the building's architecture. The Dee and Charles Wyly Theatre opened in 2009 as part of the AT&T Performing Arts Center. The exterior is aluminum and glass. The flexible interior spaces are largely non-precious materials intended to be re-drilled, re-painted, and reconfigured in multiple ways — a far cry from the marble elegance of other Arts District venues. Seating and balconies are meant to be removed as scenery would be. "This allows artistic directors to rapidly change the venue into a wide array of configurations that push the limits of the 'multi-form' theatre: proscenium, thrust, traverse, arena, studio, and flat floor...."
The architects, Joshua Prince-Ramus of REX and Rem Koolhaas of OMA have been partners in design for a long time, each pushing the limits of the other. The 12 story venue has become a prototype of modern flexible theater design. "A machinelike interior clad in metal, the Wyly evokes a magician’s box of tricks," wrote New York critic Nicolai Ouroussoff, "and, if used well, should allow for continual reinvention of the theatergoing experience." 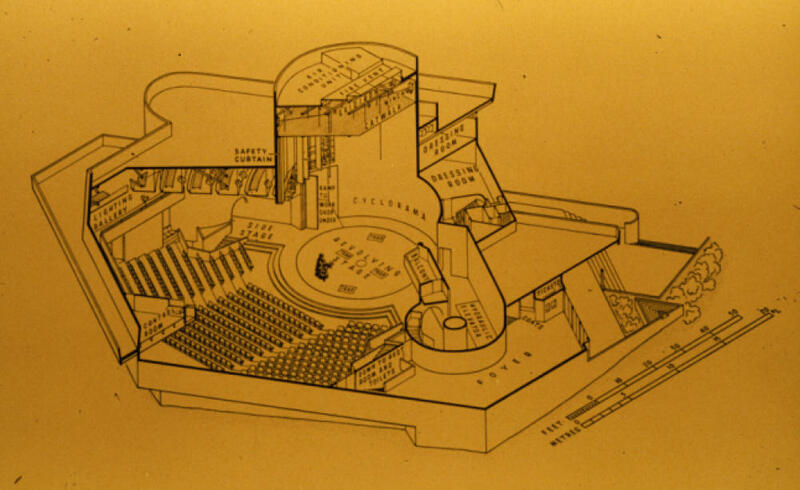 The original venue of the Dallas Theater Center was the 1959 Kalita Humphreys Theater designed by American architect Frank Lloyd Wright. When the Wyly opened in the Dallas Arts District about two miles away, the badly remodeled work of an iconic architect was left behind. "The move has left the Kalita as an architectural stepchild of financially challenged parents with differing agendas who don't want to accept responsibility for their ward," wrote local architecture critic Mark Lamster. "The lack of clear lines of authority is a typical problem for Dallas arts institutions, but the entanglement is particularly pronounced here." Pei Cobb Freed & Partners Architects LLP. Dallas City Hall. REX. "AT&T Performing Arts Center Dee and Charles Wyly Theater."